If the kids are bored when camping, you can always pull out a deck of cards. A deck of cards opens a lot of possibilities! 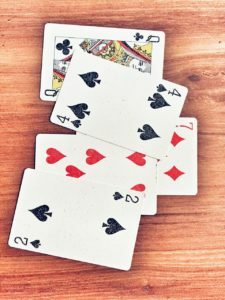 So here are a few card games for camping kids. Shuffle the deck and deal 5 cards to each person. This is a game where more people tends to mean more fun. The goal is to be the first person to run out of cards. In order to get rid of those cards, you have to find a match. That is, if you have two 8s then that’s a match, or if you have two Kings. In order to make those matches, you ask other players if they have a card to match yours. If they do, they give you the card and then you place down the match. But be careful! If your opponent says “Go Fish”, that means they don’t have a match! If this happens, you have to draw a card from the deck. Some people use a rule stating you have to draw until you find a match, but that’s up to how you want to play. Others play by a rule stating that you may play a match if you draw it. Either way, your turn has ended. War is similar to Go Fish, at least in goal. In order to win, you have to be the first to get rid of all the cards in your hand. Hand each person five cards, just like in Go Fish. To start, you take the card on the top of the deck and turn it over face up. Set the card next to the deck, this will be the “discard” pile. On each player’s turn, they must play a card that “beats” the previous card placed into the discard pile. For example, a 10 “beats” a 9 because the 10 is a higher card. If you don’t have a card that beats the previous card, you either draw cards until you do or draw a card and then turn the next card in the deck face up into the discard pile and play off of that. These are just two card games for camping kids. There are others, so just remember to keep a deck of cards around! Whether you’re an RV camper, car camper if you’ve got a pool at home, a space to hang dry wet towels is a must. Draping dripping towels over premium seating space isn’t always ideal when you’re camping, especially if you’ve got visitors or a large crowd. This DIY towel rack provides the perfect solution, allowing all your towels to air dry quickly, so you can get back to your summer fun in the water. What’s fun about this style of towel rack is that it’s built in such a fashion that it can double as a shade for kids if you cover it with a blanket or dry towels. Don’t want to build your own? No problem, let a small business person build one for you!